This die-cut, padded board book and beautifully animated DVD come together to offer great family entertainment at an unbeatable value. Told simply, in a language even the youngest family members will understand, this story begins with three young trees who dream-as children do-of doing big deeds. Yet when the woodcutters come, the trees each find that the reality of their existence doesn't match their dreams. Vivid visual imagery brings this classic legend to life, sharing a simple lesson about God's plan for each of us. Share the book with a little one as a bedtime story or gather the whole family and pop in the DVD-either way, this set offers hours of rewarding family entertainment. The DVD includes a fully animated 30-minute retelling of this classic folk tale. Narrated by Hal Halbrook, the touching story contains a simple lesson about God's plan for every life. 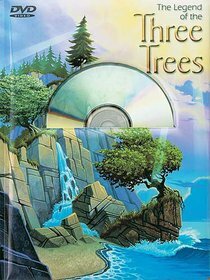 About "The Legend of the Three Trees (With Dvd)"